Long ago, before time was counted and broken down into small units designed to eat up our lives, there existed a proud people that dwelled in what we call the east. They existed in peace and harmony from the beginning. These people called themselves Black, naming themselves after the color of the earth from which they came. These people were many but divided into different tribes each one being led by their own chief. There was never a need for all of the people to come together because there was plenty of resources for them to exist in harmony. In one of the tribes, lived a young man by the name of Gye. Gye was the eldest son of a chief named Conive and was in line to rule his tribe. Gye had a younger brother name Sen who was very jealous of Gye's position. Sen happened to be chief Conive's favorite. Together they often schemed to make Gye look bad before the people and to throw him into disfavor. Sen was in constant competition with Gye, and won most of the time. Gye was not much of a competitor and did not need outward victories to feel good. Sen felt he should be the next in line to rule his father's tribe and cried to his father constantly about the fact. Chief Conive was getting up in age and knew that very soon he would have to pass on his chieftancy. He loved Sen but he tolerated Gye. These two young men had different mothers. Whenever Gye asked about his mother, the only response that he would get was that "she left to get away from her responsibility." Sen's mother still was around and she wanted her son to become the next chief. So she constantly stayed in chief Conive's ear about her son moving into power. The major problem with Sen becoming the next chief was that tradition demanded that the first son must receive the mantle of chief upon his father's retirement. The time was coming for chief Conive to move into co-rulership role with his heir so that he could train him in the ways of being chief. Sen's mother would not have her son looked over for Gye. So she let her son know that he needed to take action quick if he ever wanted to fulfil his destiny. Sen came up with an idea and sought council from his father. His father gave him the go ahead and the resources to get it done. He would hire 5 bandits to kill Gye on his morning walk. As he usually did, Gye woke early in the morning to to commune with the Creator and his higher self. Gye was very dedicated to developing himself through his relationship with the Creator. In his prayer he asked to see a Phoenix and to be able to have the courage to capture a feather. For it was said that any man who could get close enough to Phoenix to pluck a feather would be forever transformed. Just having the feather of a Phoenix opens destiny's door to you and all of your visions would become reality. Gye left his compound at his regular time, walking towards the forest, not knowing that lurking in the woods were the bandits that would take his life. As soon as Gye got out of sight of his village, they sprang upon him, beating him senseless. Right before the final blow one of the bandits raised his voice to stop all activities. "We have beat him severely and he may not survive, but there is no use in killing him when we can sell him into slavery and make more money". "Brother, we were paid by the chief and Sen to eliminate him!!!" "Selling him into slavery is elimination. He will be taken far away from here never to be seen again, and we will be all the richer. We will just bring back his bloody clothes to prove he is dead and take a vow here and now that we will never discuss the truth of Gye to anyone including each other." "Good idea. Let's do it," another bandit said. So these five bandits made their oath over Gye's body not knowing that he was partly conscious. He had heard that his own family had betrayed him and that he would never see his village again. Three of the bandits stripped Gye and carried him toward the west to be sold. Then the other two bandits took the clothes to his brother Sen to collect their money. When they finally made it to the market they sold Gye and left him with a slave driver who had to give Gye time to heal for the grueling march ahead. The slave driver needed to wait for more captives to come in anyway to make the trip profitable. Gye rested and healed for 5 days then the march began. All of the slaves were shackled together by their ankles and wrist. The whole group had to walk as one or be injured by the chains. The march lasted 33 days. Many people died during the process. For the trip was very arduous. On the 33rd day the slave traders were ambushed by a group of skilled warriors. They moved so fast that they could barely be seen. They slayed all but one slave driver. They let him live to pass on the message that no slave driving would be permitted in or through their lands. These warriors set all the captives free, and everyone ran for their lives terrified but Gye. These warriors looked more like ghost and monsters rather than men. They showed absolutely no mercy on the battlefield. Gye realized that the warriors had on costumes to scare their enemy. Gye over came his fear and begged the men to take him with them and train him in their ways. At first they laughed at him and said he would not last a week. Then he explained his circumstances. He could not return home for it was his father and brother that tried to kill him. The eldest in the group took pity on him after hearing his tale, and took him back to the council of wisdom to decide his fate. Gye stood before the council of wisdom of the Nyame people. They listened to his tale of woe and deceit and told him that he was welcomed to stay amongst the Nyame. Gye then asked if he could become a warrior. The council warned him that if he chose to be a warrior that it would be a very difficult road. They also had to consider his age as well. The Nyame warriors began their training very young and Gye was already a grown man. Gye acknowledged that he was willing to take any hardship that came his way, and that he wanted to be a productive member of society. The council first told him that some years ago they had saved a woman from his tribe in the east. They felt that he should meet her then they would begin the process to see if he was worthy of becoming a warrior in their culture. The woman was summoned and when she came forward a look of recognition came over her face. First she asked Gye his name. When he told her she stepped back. Then she asked his father's name. Gye told her. She looked at him and asked about his mother. Gye told her that she ran away and left him when he was very young, and his father never spoke of her. She revealed to him that she was his mother and that his father had sold her into slavery because she caught him with another woman. She threatened to take the information to the council of elders. This would not only be embarrassing but it would have cost him the trust of the people because she was loved in the village and surrounding territories. To prevent this he had her sold into slavery and made it look like she ran away. She was rescued by the Nyame who adopted her as one of their own. Then Gye told her his story of deceit and betrayal by his father and his brother. She started to cry and he comforted her. She told him to learn as much as possible from Nyame because they were advanced in all the sciences including war. They only chose to live secluded from the rest of the world to keep their sciences, culture, and spiritual technology (use of axe') from being bastardized and used to knock what they called the Umoja out of balance. After spending a few days with his mother Gye reappeared before the council to receive his test. Following tradition, the test was on three levels with the first level being spiritual. At this level, Gye was asked to share his principles of living with the council by way of teaching and then to answer the questions of the council. Then he was put in a room in front of a table and asked to visualize everything on the table after one glance. The next test was mental, he had to solve two riddles. 1. What exists in a shell but cannot be touched, but touches all things, and cannot be seen, but can see all? 2. What animal flies toward the sun to die but yet lives forever? The last test was to see his physical coordination. He was put in a ring and asked to simulate a battle between himself and an opponent. On all the tests Gye did poorly, but never gave up. The council was impressed by his ability to hang in there and try repeatedly. He never got upset at ridicule or laughter and never became disheartened. He was accepted into the community as a warrior in-training. Many years passed along with many trials for Gye. It took ten years of training for him to become a warrior and another five years to be accepted as a Nation Builder. 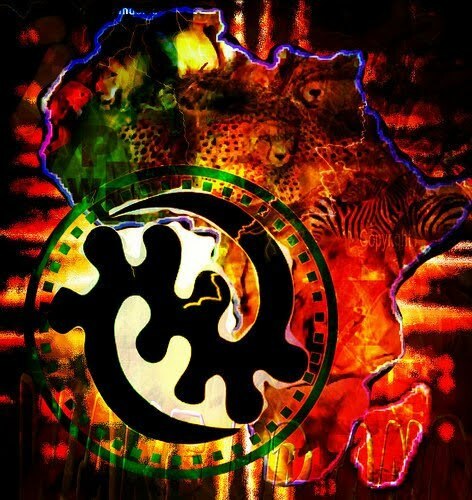 The Nyame taught Gye how to first build himself, family, community, on up to his nation. Step by step they led him. He learned their spiritual technology, learned critical thinking, and the sacred warrior dance (martial arts). He became a strong and principled man. When he completed the training he surpassed his entire class. The Nyame usually start training their warriors at the age of 5, but they made an exception for Gye. He was determined to make it through. During the process he learned many secrets about the human being and all the life surrounding him. He pledged to hold his new knowledge sacred and to only use it in a just causes. Gye reunited with his mother as much as possible. He later found out that it was because of her he was accepted into the warrior training. She was such an honorable woman that her requests were always respected. She also taught him many things about the world around him. She sat him down in his 16th year as a Nyame and told him that she was glad that he chose the warrior training. She wanted him to know that she was proud of him, but now it was time for him to return back to his home. Gye was shocked but something in him knew that she was right. She felt that it was time for him to claim his village, and become a great chief. She also told him that with his new found knowledge he could unite all their people. Gye swore to her he would do this. For this to happen, Gye had to go before the council of Wisdom. They had expected this day to come and gave him their permission if he could bring back the feather of a Phoenix. The council told Gye where to find the mythic bird and warned him that only a person with a pure heart could retrieve a feather. They also told Gye that he could take no weapons with him on this journey. They would do him no good anyway against the fire bird. Gye agreed and set out on his journey. It took him three months to find the sacred mountain that elders described and then it took another three to find the Phoenix nest. Gye was instructed that the best time to get a feather was when the sacred bird was eating dew in the morning. He was also told that the bird would not hurt him if he showed no fear and if his heart was pure. The council revealed that only one other person had returned from such a journey, but he was not told who this person was. Gye viewed this mystic creature from a distance and he could not believe the beauty of this animal. While the creature was eating the morning dew, Gye went to its nest hoping to find a fallen feather, but he did not. Phoenix birds never lose their feathers. Gye hid himself and figured he would sneak up on the Phoenix while it was sleeping, but he also had no luck there either because the holy bird never sleeps. Gye finally decided to run and try to catch the giant bird by surprise, but was shocked when the Phoenix turned around and looked him straight in the eye and spoke. Gye stopped dead in his tracks not knowing whether to run or to drop dead on the spot. "It took you long enough to build up the courage to approach me. Didn't you know that the only way to get one of my feathers was to pluck it from my body yourself?" "N N No holy one I did not know that." "Young one are you ready to die in your effort. I have destroyed thousands of your kind who dared to approach me for selfish reasons." "Yes wise one I am willing to die in my effort if that is the price that I must pay." "Then come forward and feel the fire of the sun burn away your flesh." At first Gye felt a rush of fear run through his body, but then he remembered his training with the Nyame people and enlisted his feelings of fear to aid him. Then he also remembered that his cause was righteous and that he believed in it with all his heart. He rushed toward the fire bird ready for whatever came his way. The Phoenix shot flames of pure fire at Gye that hit their mark. Gye felt rush of heat followed by an unbearable pain, but he continued moving forward. Gye kept moving but he looked at his hands but they were not on fire. The pain that he was feeling was coming from within. Whatever the holy bird was burning seemed to fall away from Gye. At this point the pure flamed stopped and Gye heard a thump behind him. He turned around and saw what looked like his body on the ground. He turned to the Phoenix and moved forward, but there were no flames. "My dear Gye, you have no idea what happened to you. You have been transformed young man. My flames do one of two things, totally destroy or transform. You have been transformed. Your heart was pure and you showed no fear." "What does this... this transformation mean?" "It means that you have a choice to make. Either you can stay here in paradise or you can return to the world from which you came." "What paradise? The only thing I see is your nest." "Look around you my son." As Gye turned to look in disbelief he could not believe his eyes. The land around him was so lush and beautiful. When he completed his turn to face the Phoenix he could see a golden city behind it in the distance. "You mean I could live there?" "Yes, or you could go to another city if you wished or even build your own." "Here my son we are not bound by time, but you may stay as long as you like. You can always decide to be reborn and start a new life. Unless you would like to continue with your old life." "What would happen if I chose to continue with my old life?" "Two years I thought you said times does not effect us here?" "It doesn't but the other worlds must stay in motion. Just because you come here does not mean that all creation stops. From here we can watch civilization after civilization rise and fall if we wish." "I have to return to fulfil my oath to my mother." "Very well young one you may return, but the world will not be the same for you. You will no longer exist as a mortal being. You have seen the eternal so you will forever be changed. Turn around and face your shell." As Gye turned around he was back where he started. His shell was lying before him, and all of a sudden it rose before his eyes and bowed on one knee. "My son this your shell this the part of your being that the world thinks is you. It bows before you now as your servant. You have become a true Master. Accept your shell now and you can return, or walk towards me and I will fly you into eternity." Gye accepts his shell and turns toward the Phoenix and bows. "You are one of the few of your kind to return after seeing paradise. When it is your time to return to eternity I will come for you my brother. You will sense my approach and at that time rejoice for I shall bring you home." Gye looked at him stunned. "Home?" "Yes home. You no longer belong here as you soon will see, but I sense a great destiny ahead of you in this world. So complete your obligations and I will see you at the end of your life." "Holy one...... may I have a feather?" "Yes. Even though you carry a Phoenix in your heart, I will allow you to take one of my feathers to prove that you have completed your mission." Gye bows and moves toward the holy being. Touches the Phoenix and plucks a single feather from it. "You are welcome young one. I look forward to seeing you again, rarely do I run into one such as you. I see that you shall give birth to a people and you shall call them Gye-Nyame." "Yes. I will do as you Will wise one." Gye left and returned to the council of wisdom. When he entered the chamber they immediately knew what he possessed and before he could open his mouth they told him he was free to go. They also told him that it was time for the Nyame to move on, for he was a signal from the Creator that their time on this plane was up. Gye told them he understood. Before he left the council chambers they informed him that he now was reborn as a Nyame. They told him that the founder of their people went seeking the Phoenix as well and when he returned he gave birth to their nation naming it after himself. He went to say goodbye to his mother and offered her the chance to come with him, she declined. When he left the city he did not look back for deep down he knew that it was no longer there. The world looked totally different to Gye now. He could feel the pain of earth and her children. He instantly knew people's hearts when he met them. he knew that he was responsible , and had to help guide the world before it destroyed itself. When he entered his people's land the sadness was so thick that Gye had to rest. The sorrow over took him and he could barely handle it. Before he was to make his return he had to get use to his new abilities because he could easily be overwhelmed. Gye found a private location and went into meditation. It had been almost 20 years since Gye had been home and a lot had changed. Gye's father and brother had expanded their tribal borders and caused a lot of needless death. Blacks were fighting Blacks and a select few were profiting from this. Chief Sen and father Conive were robbing the people by over taxation. They were selling their own people off into slavery for money. The people were oppressed and had nowhere to turn. Gye made an entrance at his brother's compound. His brother did not recognize him at first. Immediately Sen was jealous because of the unnatural glow of power around this man. At first Gye wanted to destroy Sen, but when Gye looked at his brother and saw the dark energy radiating from his shell, Gye felt nothing but pity for him. This was a man that was totally at the mercy of his shell. Gye approached his brother. "Chief Sen I have been traveling for many years to get to your village and I would like to have your permission to stay." "My lord many years ago I lived in your village, but I was kidnapped by some bandits and sold into slavery. I recently escaped and made my way back home." "Of course you are welcomed here, but first stranger give me your name." "Sir my name is Gye son of chief Conive." "Impossible, that would make you my brother, and my brother died almost 20 years ago." "My brother that also means that I am the true ruler of these lands and people." "If you are who you say you are then you first have to get out of my compound and seek an audience with the council of elders. I don't think that is going to happen." Chief Sen raises his hand and the gate closes and twenty men appear. "Gye many things have changed since you left. I'd like to introduce you to my personal guard. They will make sure that the miracle of your return to us will be brief and painful, destroy him!!!" Gye had already sensed the trap so he prepared his mind and body. The men came running at Gye all at once spears in hand. Gye grabbed the closes spear to him did a backward roll flipping the bearer in the air. Before he hit the ground Gye was already on his feet battling with the other 19 soldiers. No one could believe their eyes because Gye was moving so fast and with such accuracy that one soldier after another fell to the ground. One minute he would be standing up the next second he would be on the ground flipping and moving like a monkey. Not one of the soldiers could keep up or even defend themselves against him. The last 5 standing surrendered to him and dropped to their knees and pledge allegiance. To prove their seriousness they immediately surrounded his brother Sen.
Sen fell to his knees begging for mercy. "Brother please have mercy upon me. You can have the village and the treasure just let me live. Spare me, for I spared you." "Sen there is no need to beg for your life and there is no need for you to lie. You didn't spare me your killers sold me into slavery to fatten their pockets. My brother I will let you live, but you will not live here. You must go out into the world off of our people's land, reciprocity will surely deal with you." Word spread quick that Gye had returned, and also about his battle with the guards. The people were thrilled. They had prayed for someone to come and relieve them of the injustice that had been plaguing them for the last few years. When father Conive heard that Gye was back he had a heart attack and died from the shock. Sen and his mother were caught by some of the people as they were trying to leave. They killed Sen's mother and burned out Sen's eyes. Gye immediately called the Council of elders together to meet and have them declare him the new chief. His first act act was to lower the taxes that sen had placed on them. Then he immediately began to train the military to protect their borders from slave raiders. He then gave back the lands that Sen and Conive took from the surrounding villages. Gye then spent the next 3 years teaching and training his people. At the end of the three years Gye's village had a well trained army but no war or crime. All the village's children were in school or being trained in a trade, and the people began to prosper. Once Gye got his home straight he went to surrounding villages to speak with the other chiefs. He let them know that he was trying to establish a council to organize all Black people. He went to all of his people's villages and offered all the chiefs a seat on the council. At first the chiefs thought it was a trick, but when they heard about the improvements that Gye made in his own village they became more open to working with him. as the council grew so did their power, the council elected Gye as their leader. Gye's next goal was to go to each village and find righteous young people that he could pass on the knowledge that he had learned from the Nyame and the insights he picked up with his new abilities. These young people would become the Gye-Nyame people that the Phoenix told him about. He set up an intense training program for these people because he knew that they would become the future leaders of this new nation that was forming. Gye found one person from each village to start with. The process took 15 years for the first group and each one swore to only pass on the knowledge that they attained to worthy people. Gye had many more trials and adventures before the Phoenix came to get him, this is just the beginning of the story.